There are lots of reasons why kids can be reluctant to wear the glasses they need in order to see clearly. Glasses are easily lost, can get in the way during active play and are easy to forget when they’re still new. It’s also not easy to adjust to new glasses when other kids poke fun at them. Even good-natured ribbing can make a child resent her glasses, and it’s not uncommon for kids’ self-esteem to take a hit when they feel like their glasses make them look different. Helping your child adjust to life with glasses doesn’t have to be an insurmountable task, though. There are ways that you can support her as she gets accustomed to her new fashion accessory, even if she initially sees them as a burden. 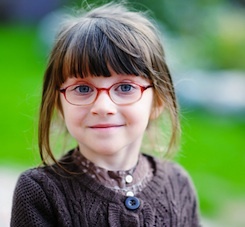 Your child is more likely to embrace her glasses when she has a hand in picking out the frames. Rather than feeling like her glasses are an encumbrance foisted upon her, she may even be excited about frames she’s chosen herself. Frames can get pricey, so you may need to narrow the options down to only those that are within your budget, but it’s still a smart move to get your child involved in the process. Remember that kids are anxious to assert their independence, and that being forced to wear frames she absolutely hates will only make the experience more upsetting. New glasses can be uncomfortable if they’re not fitted properly. When they’re too tight, they can squeeze at her temples and cause headaches. When they’re too loose, they’ll slide down her nose and she’ll be forced to shove them back into place every time she moves. Before you leave the optometrist’s office, make sure that the frames fit her head and aren’t uncomfortable for her to wear. Just like an itchy sweater, a binding dress or ill-fitting shoes, glasses that don’t fit will be loathed. It’s hard enough to get a child to wear glasses that don’t hurt or get in the way; when they’re uncomfortable, you’ll be fighting a never-ending battle. Your child will take cues from your behavior to determine her own reactions, so make sure that you don’t greet the news that she needs glasses with negativity. Keep your attitude upbeat and positive, point out cool entertainment figures that wear glasses and offer plenty of reassurances that she looks great in her new glasses. When she inevitably protests or “forgets” to wear her frames, it’s also a good idea to keep your nagging to a minimum. Creating a power struggle over the glasses will only make her more determined not to wear them, so offer friendly reminders instead of demands or exasperated comments. Though it may seem deliberate, your child could actually be forgetting to put her new glasses on at first. Remember that she’s spent her entire life without glasses, and that it’s not always easy to adjust to something new. Make putting her glasses on a part of her morning routine, just like brushing her teeth or getting dressed for school. After a while, it’ll become second nature to reach for the specs before she leaves the house. Most big changes in a child’s life will require you to be patient, as kids don’t always latch on to new developments right away. She didn’t learn to walk overnight, she wasn’t potty trained in a day and she may need a bit more time than you realize to get used to the idea of wearing glasses all the time. Being too forceful or losing your patience with the pace with which she adjusts won’t help matters at all, so be sure that you keep your cool while she’s getting used to them. Just because you feel like she should be making the adjustment more quickly doesn’t mean that she’s able to, so let her set the pace. Your child may be more receptive to the idea of wearing glasses if she knows that they’re temporary, so let her know that contact lenses are an option when she gets older. If she feels chained to her glasses forever, she may be more resentful than if she understands that there are other corrective options available to older kids and teens. New glasses can be a lesson in patience and acceptance for a kid, especially if you approach the situation with that in mind.